Floyd Collins was a real person. He was exploring a cave in Kentucky in 1925, a time when sensational accidents, lurid crimes and freak shows were huge national news, and he got stuck, his leg wedged under a rock he couldn't move. Although some of his would-be rescuers could initially get close enough to bring him a little food and light, conditions in the cave deteriorated and they couldn't free his leg or get him out. But they could ferry info back to the radio broadcasters at the scene who were sending out every detail to homes across the country. It was huge news, a jump forward for mass media, and in 1925, a dramatic tale of life and death that played to Joe and Sally Sixpack like nobody's business. Composer Adam Guettel wrote music and lyrics to turn Collins' sad story into a stage musical, collaborating with book writer Tina Landau, who contributed additional lyrics. Guettel's score combined bluegrass and folk with classical influences to try to capture Kentucky in the 20s, and it certainly earned its share of fans over the years, with songs showing up in concerts and albums. Floyd Collins premiered in Philadelphia in 1994, transferring to Playwrights Horizon off-Broadway in 1996, with a cast that included stars like Jason Danieley and Brian d'Arcy James. A 2012 Chicago production at BoHo Theatre was also well-regarded. The BoHo show was directed by Peter Marston Sullivan, who received his directing MFA at Illinois State University, with IWU grad Sarah Bockel as Floyd's sister Nellie. Bringing Floyd Collins to central Illinois seems like a natural, especially at Urbana's intimate Station Theatre, where Collins' dilemma will be played up close and personal. Kyle A. Thomas directs the musical for Urbana's Station Theatre with a cast that includes Andy Hudson as the doomed spelunker and Celebration Company favorites David Barkley, Mikel L. Matthews Jr. and John Tilford also in the mix. Director Thomas will play Floyd's brother Homer, with Kyle Kinnamon, Grant Morenz, Mark H. Muller, Michael Murphy, Quinn Murphy, Jodi Prosser-Muller, Craig Smith and Marah Sotelo completing the ensemble cast. 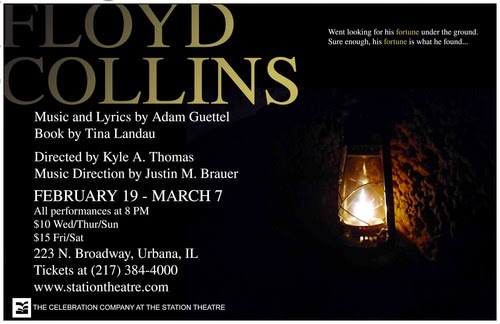 The Station's Floyd Collins opens tomorrow, February 19, with performances running through March 7. Check out the Station Theatre website for all the details. Will You Be Taken By HOSTAGE at New Route?